Catalogue published in conjunction with Parsifal (1882-39, 969, 364, 735 AD) and The School of Velocity, two time-based music installations. Cooperatively produced by the AGYU, Yves Gevaert, and The Renaissance Society at the University of Chicago. Contains essays by Marie-Ange Brayer, Boris Groys, Matthew Teitelbaum and Jeff Wall. 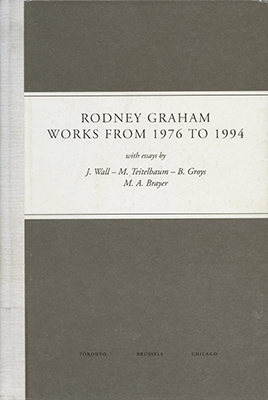 Includes bibliography and catalogue raisonn. Winner of the Ontario Association of Art Galleries 1995 Design Award. Order your copy of this book by clicking here.